Plant: Annual twining vine; stems twining, densely to sparsely pubescent throughout Leaves: ovate to orbicular, 5-12 cm wide and long, entire to 3-5-lobed, basally cordate, the lobes apically acute to acuminate, pubescent, the petioles to 12 cm long, rarely longer INFLORESCENCE: 1-3(-6)-flowered cymes; peduncles 5-10 cm long; bracts foliaceous, elliptic to lanceolate, 5-8 mm long Flowers: on pedicels 3-7 mm long, erect in fruit; sepals 12-24 mm long, 4-5 mm wide, herbaceous, lanceolate, abruptly narrowed from the rounded base into a narrow acuminate apex, usually curved at least in fruit, the apex sometimes strongly curved, densely long-hirsute at least on the basal 1/3; corollas funnelform, 2-3.7(-4.5) cm long, light blue, the tube white or pale yellow inside, the limb 1.7-3.5 cm wide; stamens 12-15 mm long, included, the anthers 1-1.5 mm long, white; ovary conic, 1 mm long, 3-locular, pubescent; styles 12 mm long Fruit: FRUITS globose, somewhat depressed, 8-12 mm wide, enclosed within the sepals. SEEDS 1-4, 4-4.5 mm long, pyriform, black to dark brown, densely pubescent with short trichomes Misc: Disturbed ground, roadsides; 900-1900 m (2900-6100 ft); Aug-Nov REFERENCES: Austin, Daniel F. 1998. J. Ariz. - Nev. Acad. Sci. Convolvulaceae 30(2): 61. Annual vine 1 - 2 m long Stem: twining and climbing, slender, hairy, and if cut or broken then exuding a milky sap. Leaves: alternate, long-stalked, non-toothed, hairy, 5 - 12 cm long, three-lobed (occasionally five-lobed, rarely without lobes), with indented base, and each lobe base rounded with rounded areas between lobes, but each lobe tapering to a pointed tip. Flowers: many, one to three per leaf axil, short-stalked (shorter than leaf stalk), usually blue or purple, sometimes white, showy, 3 - 5 cm long, radially symmetric, funnel-shaped or somewhat trumpet-shaped. Sepals: five, conspicuously hairy below middle, 1.5 - 2.5 cm long, lance-shaped, widest at base then narrowing near middle and tapering to a long, linear, pointed, recurved tip. Petals: five, but fused into a tube or funnel with flaring or spreading limb, which may be shallowly five-lobed or merely wavy along edges. Stamens: five, attached to inside base of petal tube, not extending beyond petal tube. Pistil: with one, three-chambered, superior ovary; a single style shorter than the petal tube; and one stigma with three small, rounded lobes. Fruit: stalked, two- to four-valved, one- to three-chambered, rounded capsules with two seeds per chamber. 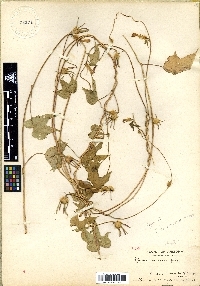 Similar species: Ipomoea hederacea is most similar to I. purpurea, except that species usually has unlobed leaves, and the sepals are only up to 1.5 cm long and rarely have very long pointed tips. Other species of Ipomoea in our area have hairless sepals (or sometimes with a few bristles on the edges), white flowers (or some with purple or red coloring in the throat), and only two-lobed stigmas. Habitat and ecology: Introduced from tropical America, often found as a weed in agricultural fields, cultivated areas, and other waste ground. Etymology: Ipomoea comes from the Greek word meaning worm-like, possibly referring to the twining and twisting stems, or the twisted flower buds. Hederacea refers to ivy, in this case the similarly shaped leaves. A local, infrequent or frequent vine of cultivated and fallow fields, along roadsides, and rarely in open woodland.